Review: Bart Ehrman – Did Jesus Exist? A paradigm shift is in progress. The mythic Jesus, an idea simply ignored by the vested interests of religion and conservative scholarship, has finally compelled a noted mandarin of the holy texts to issue a denial. "But of course Jesus existed ..."
The non-existence of Jesus has passed from "lunatic fringe – ignore" to "ridicule – dismiss". Bart Ehrman, a dangerous radical by traditional standards, risks becoming the Martin Luther of the internet-enabled Reformation. His whisper-thin defences of a historical Jesus will find few friends. The original Luther was a good Catholic who, like Ehrman, wanted to get back to the original texts. But Luther also started something he couldn't stop and the printing press did the rest! 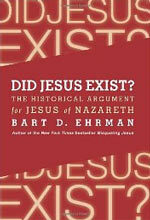 Review of Bart Ehrman's Did Jesus Exist? The charges thrown at Ehrman in recent years from Christian conservatives – that he is a "sensationalist", a "misleading" popularizer, who "over-interprets" texts and is motivated by a "hatred of religion" – now, in his latest book, he hurls further down the food chain. It is not he but the mythicists who deserve these tags. In Ehrman's eyes the "colourful ensemble" of mythicists merge seamlessly with conspiracy theorists, holocaust deniers and internet junkies in a "global cottage industry" of dangerous pseudo-scholarship (it was a mythicist, don't you know, that influenced Lenin – that's how dangerous is mythicism). Ehrman, peerless scholar of New Testament texts, has dragged himself away from more favoured concerns to draw a line in the sand on the question of Jesus. No, he is NOT a mythicist himself, the direction towards which all his books pointed and as many of his fans were beginning to think. 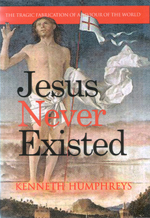 "No, no – Jesus most certainly existed" – a mantra Ehrman repeats endlessly – and was, (Christians please note), "the most important figure in the history of Western civilisation" – a statement scarcely true if, as Ehrman argues, the "man" was a parochial and deluded doom merchant, hostile to the family and fond of prostitutes and drink who was summarily executed after a two-minute trial before Pilate. The professor from North Carolina provides cold comfort for any of his Christian fans and his arrogant dismissal of the entire corpus of mythicist scholarship will cost him supporters elsewhere. The positive side to all this is that Bart – an accredited scholar, as they say – has been compelled to acknowledge that the very existence of Jesus is "one of the most pressing questions in the history of religion" and deserving of investigation. Mythicism, warns Ehrman darkly, is "seeping into the popular consciousness at an alarming rate." Ehrman's case for a historical Jesus could have been presented much more succinctly than in a 368-page book. In fact, that case has been presented much more succinctly – in endless publications from Christian apologists. Ehrman, no longer the believer that he once was, rewrites that apologetics material, minus the supernatural elements. At its heart is the "chronological side-step" (in a debate I once had with Gary Habermas he actually performed the dance): Our extant sources (the canonical gospels) belong here (70s - 90s of the first century); the written sources on which they draw belong here (50s - 60s); the oral traditions which informed the earliest written sources belong here (30s AD!!!) Glory be, "first-hand evidence" from the time of Jesus himself! "But then something else happened. Some of them began to say that God had intervened and brought him back from the dead. The story caught on, and some (or all – we don't know) of his closest followers came to think that in fact he had been raised." (page 164). "For some reason, however, the followers of Jesus (or at least some of them) came to think he had been raised from the dead." (page 233). Did you get that? For "some (unknown) reason" they "just began to say" the guy had been resurrected and "the story caught on." So how dare mythicists suggest any contamination from polytheism! And Ehrman has the audacity to dismiss mythicists for weak and unconvincing arguments. "I think there is a good deal to be said for the idea that Christians did indeed shape their stories about Jesus in light of other figures who were similar to him. But I also think that this scarcely relevant to the question of whether or not he existed." (page 208). "Even if it predates Paul it does not represent the earliest Christian understanding of Christ." (page 238). And Ehrman has the gall to accuse mythicists of discounting material that doesn't fit their pet theories! "The things that happen to Jesus in Matthew closely parallel the Old Testament traditions about Moses … But the fact that Matthew shaped the story in this way has nothing to do with the question of whether or not Jesus existed." (page 199). "The Gospels … do indeed contain non-historical materials, many of which are based on traditions found in the Hebrew Bible … But that has little bearing on the question whether or not Jesus actually existed." (page 207). "Where would the solitary source that "invented" Jesus be?" (page 82). Having confessed on page two that in thirty years of study of the New Testament he had no idea that a complete literature of mythicism even existed, in his opening chapter he pronounces summary judgement on this two-hundred-year-old school of radical thought – he's obviously been reading up of it in the last few months! He returns to slice up the corpse later in the book. With little ado – and as a preamble to making his own case for a Jesus of history – Ehrman dismisses each and every proponent of the mythic Jesus, their every argument either wrong or simply irrelevant. He maligns several along the way (Acharya did not fabricate the priapic cockerel, said to mock St Peter. Whether it exists or not, it had a history long before Ms Murdock's time). But Ehrman knows all about forgery and fraud in the Christian story, he wrote a book about it. And mythicists were saying Christianity was built on falsehoods long before Ehrman turned that disclosure into a nice little earner. Even in this book Ehrman strikes out several yarns beloved by make-believers. The triumphant entry into Jerusalem (a pastiche taken from Zechariah); Jesus's nighttime chat with Nicodemus (dependent on a Greek pun that doesn't work in Aramaic); the epistle of James "might not" support the historical Jesus. In short, "some stories were made up" (page 85), and again, "some of the stories were legends through and through with no historical core" (page 190). But Ehrman is determined to make his point: even if it should transpire that everything Jesus did and everything that he said were fabrication and myth, that would not in itself prove that Jesus never existed. Logically true, but as Ehrman acknowledges, history is about probabilities. If wholesale fabrication were the case, what precisely would the entirely unknown minor entity, the "historical Jesus", have contributed? If the myth had no dependence on "the man" and "the man" gave nothing to the myth, is not the real irrelevance not the arguments for the mythic Jesus but the claims made for a "historical Jesus"? There is no doubt that there were thousands of Jesuses, named for the Jewish hero of the conquest of Canaan, Joshua; and since, with the gospels, we are in the realm of story-telling, the idea of a dead messiah works just as well as an actual but unknown dead messiah. Indeed, the latter resolves into the former. Ehrman's own response is that the "historical Jesus" contributed a primary layer of belief, stories about a small time apocalyptic prophet who (secretly, to his close associates) claimed to be the messiah and king of the Jews, though not, in fact, the Son of God. These aspects pass the tests for historical probability that can be found on just about every apologetics website, tests for dissimilarity (what you might call inconvenient truths that force themselves into the record because they are so widely known), and multiple independent attestation (a pretty obvious and logical plus-point for any type of witness). And what are the sources that give the Ehrman and "all" his colleagues such confidence? Well, as it happens, they are nearly all hypothetical sources. "Papias may pass on some legendary traditions about Jesus, but he is quite specific – and there is no reason to think he is telling a bald-faced lie." (page 101). "There is no reason to suspect Luke is lying here." (page 79). By assuming honesty, we can take the next step, to maintain that the gospel writers were merely the collectors of texts and the compilers of traditions; faithfully recording their "reports" without lies, fabrications and politically motivated embellishments – in fact, behaving precisely unlike every subsequent generation of Christian scribes. Although Matthew and Luke are discounted by their dependence on Mark they are returned to the witness stand by their "unique material", drawn in common from "Q" and found separately in "M" and "L" (where each of these "may be one or many documents"!) To these are added John, Thomas (and of course their respective "earlier sources") and sundry fragments like Papias and the speeches in Acts. Ehrman further argues that some gospel passages in Greek "only make sense" when translated back into Aramaic, which for him is a proof of an earlier, Aramaic source. But even if true – and it very much depends on the opinion of the translator and his notion of what makes sense – that does not move us any closer to a "Jesus of history": it's just as easy to fabricate a story in Aramaic as it is in Greek – the Old Testament should be evidence in abundance for that! Because in the conjectured primordial Christian world nobody lies, copies or invents material, there is no possibility that Luke copied from Matthew as well as Mark and supplemented his handiwork from Josephus, pagan literature and his own imagination. No, no – the compelling case is that a sub-strata of "oral and written traditions" has been accurately preserved from "the beginning", even if there is not a shred of tangible evidence for this transmission. "Luke inherited oral traditions about Jesus … and he recorded what he had heard." (page 73). "The gospels … were based on earlier written sources that no longer survive. But they obviously did exist at one time ..." (page 78). "Scholars have long offered good reasons for thinking Luke didn't just make everything else all up." (page 81). The two utterly irreconcilable deaths of Judas (Matthew; Acts)? For Ehrman they stand not as two examples of palpable fraud but as evidence for "an early historical tradition." (page 108). Would he tolerate this sort of self-serving nonsense from mythicists? One genuine early source – earlier than the gospels, that is – and one that has the advantage of actually surviving (as a copy of a copy of a copy, of course!) is the collection of material known as the Pauline epistles. But notoriously, and as mythicists tirelessly point out, Paul's letters ("authentic" or otherwise!) are a source which gives scant support to the gospel story.
" ... in 2 Corinthians 11.32 Paul indicates that King Aretas of the Nabateans was determined to prosecute Paul for being a Christian." (page 131). So that's why! Though it's difficult to imagine why Aretas would give a shekel what newfangled idea an unknown Jew might have, the king of the Nabateans, an Arab polytheist, was apparently in a fury because he had one more Christian in Damascus! No, I just don't find anything compelling here. Ehrman is indulging in the kind of speculation of which he accuses the mythicists. "How else could someone like Paul have known to persecute the Christians, if the Christians didn't exist? And how could they exist if they didn't know anything about Jesus?" (page 85). A more "compelling" explanation would be that Paul never persecuted the Christians and this supposed very early persecution never happened. If the faith wasn't spreading like wildfire (and Ehrman agrees that the Christians wildly exaggerated the impact of their Jesus and the growth of their movement) why would anyone want to persecute a handful of rustics with a cranky idea? Ehrman devotes one chapter (the pivotal chapter of the whole book) to what he believes are the two killer blows to mythicism: the phrase found in Galatians 1.19, "brother of the Lord"; and the "certainty" that Jesus was crucified. The reference to brother of the Lord in particular has to do some pretty heavy lifting. "And other of the apostles I did not see, except James, the brother of the Lord." Consider, first, some of the ways in which Paul refers to other apostles. Use of the term adelphos (brother) abound. Depending on the translation "brother(s)" is used up to 130 times in the Pauline epistles. "Quartus the brother" (Romans 16:23); "Sosthenes the brother" (1 Corinthians 1:1); "Apollos our brother" (1 Corinthians 16:12); "Timotheus the brother" (2 Corinthians 1:1); "Titus my brother" (2 Corinthians 2:13); etc. In this context, does Galatians 1:19 "James, the brother of the Lord" really suggest a profoundly different association, that, in fact, what we have here is a reference to the kin of a flesh-and-blood figure called Jesus? If we were unaware of the gospel tales we would never make such a literal interpretation. Ironically, nor do many of today's Christians, blissfully unaware that Jesus supposedly had brothers (Mark 6.3 and copied by Matthew 13.55). And they can be forgiven for that ignorance: the authors of John, Luke and Acts never mention Jesus having a brother called James. Yet "blood brother" is the substance of Ehrman's case (and of the apologetics industry). Who really was this James? When Paul refers to James a second time in Galatians he is described as a "pillar", along with John and Cephas, yet Paul's stress in Galatians is upon how little he learnt from other men. What, even including the guy who knew Jesus all his life? Could Paul really have referred to "the brother who grew up with Jesus" so cursorily and have been so little concerned to learn more about the "man" to whom he has dedicated his life? "It is not clear how important the details of Jesus's life were to Paul", Ehrman suggests weakly (page 139). Incidentally, in this section, where Ehrman is discussing "Paul's associates", the great scholar himself makes a scribal error, confusing Zeus with Heracles (page 153). Well, we are all human! Killer blow number two is the crucifixion which for Ehrman (and a billion others of course!) is a multiply attested fact, indeed, "almost universally attested in our sources" (page 163) and a "multiply attested tradition" (page 188). After all, says Ehrman, "Who would make up the idea of a crucified Messiah? … It came from historical realities." "They were forced to come up with the idea of the crucified messiah because there really was a man Jesus who was crucified, yet they wanted to maintain that he was the messiah." (page 240). "Those who believed he was the messiah therefore concluded that the messiah had been crucified. And as a result they redefined what it meant to be the messiah. It meant one who had suffered for the sins of others." (page 246). So it seems that Jews were capable of making up the idea of a crucified messiah, they just needed a dead body to get them going! Well, there surely were plenty of dead messiahs to choose from in the turbulent history of the Jews. It is interesting how in this book Ehrman minimises his own Christian past. Even when, in denouncing Robert Price, he describes Bob as "a one-time conservative evangelical" (as if to imply some unstable mindset) Ehrman fails to mention that he himself also had worn that mantle. Ehrman hasn't entirely left his once deeply held faith; he knows Jesus existed. He has always known. He knew when he was a fundamentalist and experienced the Lord's living presence. He knew when he was a liberal Christian and was touched by the very scriptures that began to look decidedly not the words of God. Now that the "problem of evil" has – more or less – deleted God from Ehrman's belief system, Ehrman still knows that Jesus existed. His current Jesus does not amount to much but, hey, the guy is still evolving. And in the real world he wants to keep his job and go on selling books. Copyright © 2012 by Kenneth Humphreys.